Dickies Workwear introduces a brand new flame retardant workwear range for 2014 with exciting new design features and innovative fabrics. The development of the flame retardant (FR) workwear range was preceded by a complete review of sizing, fit and comfort factors to ensure workers were both comfortable and safe. The new range is made from a mix of tried and tested fabrics as well as state-of-the-art inherently FR fabrics, offering a wide selection for workers in the energy sectors. Dickies’ new flame retardant workwear features clever design innovations such as ergonomic knee pad pockets and a comfort waistband in the premium range. The comfort waistband allows workers to individually adjust their coverall waist for an exact fit while also improving the crotch area and leg lengths, helping to improve appearance as well as movement and safety. 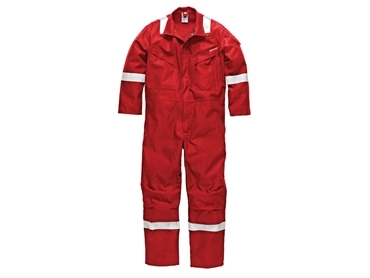 Dickies’ FR coveralls range has been increased to 15 and the workwear collection now includes base layers, jackets, trousers, shirts, bib and braces, and parkas in a wide range of FR fabrics such Proban, Pyrovatex, Modacrylics and Aramids all certified to the latest appropriate EN Standards. Given the FR market being driven by the oil, gas and energy industry, as well as a growing export market, Dickies has made the range suitable for a wider range of climates experienced around the world from northern European temperate climates to hot, humid tropical climates with special fabrics used to reduce heat stress for the wearer, and the improved insulated FR range for extreme cold conditions. Jim Hanna, Dickies International Business Development Manager explained that safety was the driving factor in the development of the new range and involved a lot of hard work in the selection of fabrics and the design and fit of the coverall. He adds that Dickies is already working on product development for 2015, observing how improvements in fibre technology down to its molecular structure and also the weave construction and careful fibre blend can make a massive difference to the performance of an FR garment under a flash fire or electric arc assault. In addition to all the new products, Dickies also offers a Corporate Bespoke Service where their experts and technicians can design and supply workwear according to the end user’s exact needs.